I wanted to make raisin bread, however I was intrigued by this recipe for Panettone in my Bread Machine Bible. The only familiarity I had with panettone was the packaged variety from Williams Sonoma which was $40+ for what seems like a glorified fruitcake with the peculiar ingredient of chestnuts. 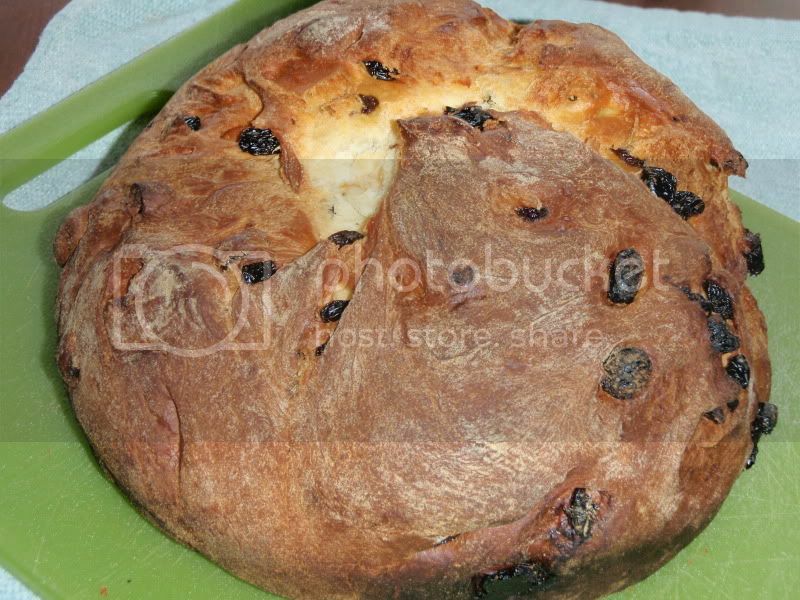 A little bit of research yielded that panettone is a traditional Italian Christmas bread, generally made with raisins (or sultanas), citrus peel, butter and eggs. This recipe was simple enough with my trusty breadmaker, although it is a two-step bread--dough in the breadmaker and bakes in the oven. Not having any dried citrus peel (and really wanting to make a raisin bread), I used a full cup of raisins. 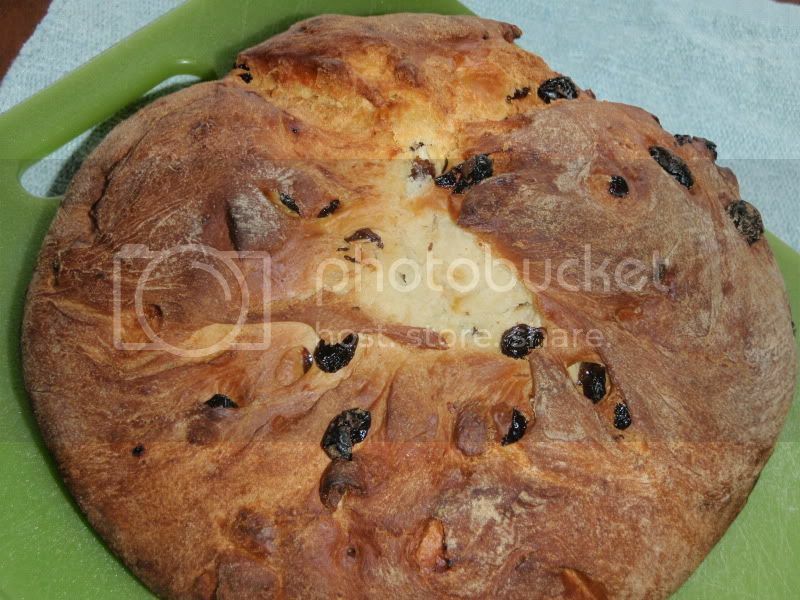 Other than to make it more presentable for gift givng, I don't understand why it is baked in a round shape, thus I may in future try it in an ordinary bread pan or possibly cook it all the way in my breadmaker. My bread browned a bit more than I liked, which made for an extra crunchy crust at points (but the inside is soft and yummy). Although I have a thermometer in my oven (a must for baking), I didn't look at it too carefully and learned only later that my oven is 15 degrees cooler than it claims, not 25 degrees as I had been adjusting for until now. I'm not sure if that 10 degrees would really make such a difference, so it might be best to watch it closely during the initial browning stage. Still a nice-looking bread. Mix eggs and milk and pour in base of bread pan. Cover with flour. Place salt and sugar in opposite corners. Dot with melted butter. Make well in center of flour and add yeast. Set bread machine to "Dough" cycle. When machine beeps, add in fruit and lemon zest. When dough cycle is complete, my machine takes about 2 hours with preheating, turn dough onto floured surface and punch down lightly. Shape into a ball and place in pan. Cover and leave to rise in a warm place until double in size (about 45 min). Preheat oven to 400 degrees. Brush with melted butter and bake for 15 minutes. Reduce temperature to 350 and bake for 30-35 minutes until top is golden brown and crisp. Cool on a wire rack.